At the time, official documents about the battle only made excuses for the army’s loss. Calloway (Native American Studies/Dartmouth Coll. ; Pen and Ink Witchcraft: Treaties and Treaty Making in American Indian History, 2013, etc.) concisely recounts this short-lived halt to America’s westward expansion at the Maumee River. The Wabash Confederacy included not only many Native American tribes, but also traders and agents intent on preserving their homes. Penned in on the north, south and east, America was ready to move west, but it was already occupied by Native Americans. The English had ceded all land north of the Ohio River to the tribes, but Americans felt no need to honor that agreement and gradually encroached. The first few settlers were acceptable, but wealthy land speculators were looking to make their fortunes. Gen. Arthur St. Clair was sent to clear the area—if not by diplomacy then by total war. Pushed too far as villages and crops were burned, the tribes united in an effort to halt the encroachment. Now a coordinated army with a battle plan, their hit-and-run tactics easily routed the undisciplined Americans. The Founding Fathers’ fear of a standing army left St. Clair with a force of only a few hundred old men, substitutes and young boys with little or no training. In addition to this poorly led army, graft and shoddy provisioning foretold a loss—all true, but the simple fact is that the Confederation fought a better battle. 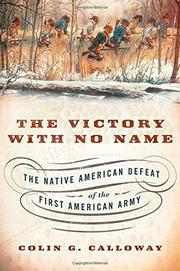 The author ably explains the winner’s side of this battle—a herculean task since the Native Americans had no written records.